Thanksgiving isn’t complete without potatoes, and its even better if you’ve got both the sweet and regular variety. 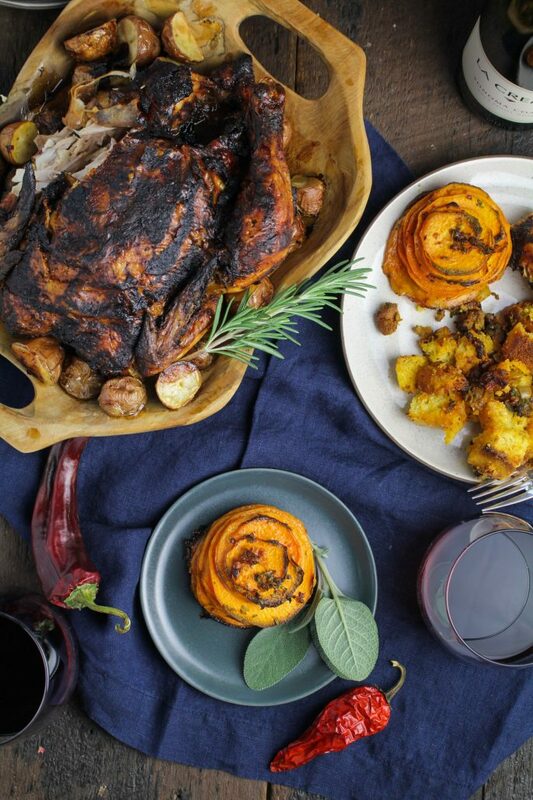 For our Latin Thanksgiving menu, we created a super simple Chipotle Sweet Potato Pommes Anna recipe. I’ve never been a fan of what I’ve come to think of as “gooey” sweet potato dishes–you know, the ones that are covered with marshmallow and brown sugar? I know a lot of people love to eat their sweet potatoes that way, but I prefer mine roasted and savory. I knew that I wanted to incorporate chipotles in adobo into this sweet potato recipe, but I didn’t want to simply cube and roast the potatoes. Thanksgiving calls for a little more circumstance than that! Pommes Anna, a classic French dish of very thinly sliced potatoes layered with a loooot of melted butter, turned out to be the perfect way to glam up the presentation of our sweet potatoes while still keeping the preparation simple. We punched up the flavor of the melted butter with chipotles in adobo and minced fresh rosemary for a deeply savory, spicy butter. 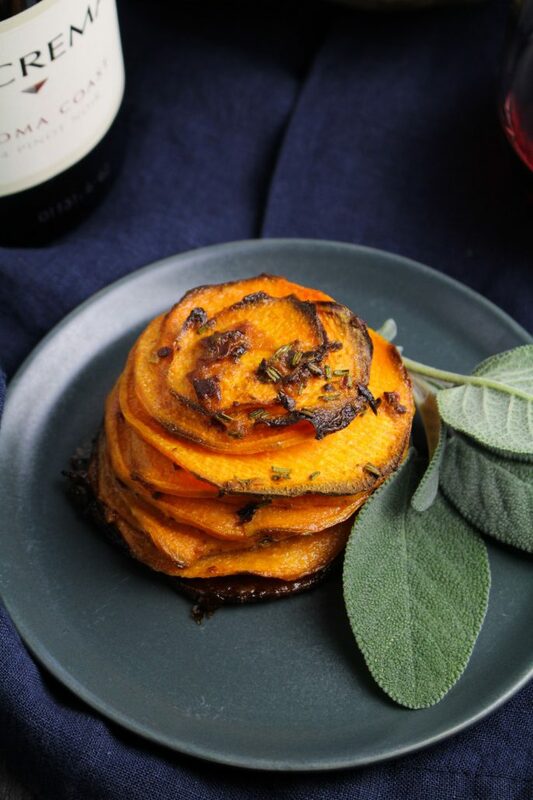 The thinly sliced sweet potatoes were liberally coated in butter then layered into neat little stacks and roasted until crispy around the edges and tender in the centers. The combination of the sweet orange potatoes and the spicy, savory butter was pretty much the best. I had to stop myself after eating one because I knew firsthand how much butter was in each serving, but I have to say, it was hard to stop. These definitely made the cut for Thanksgivings to come–easy, festive, and delicious! What more can you ask for? 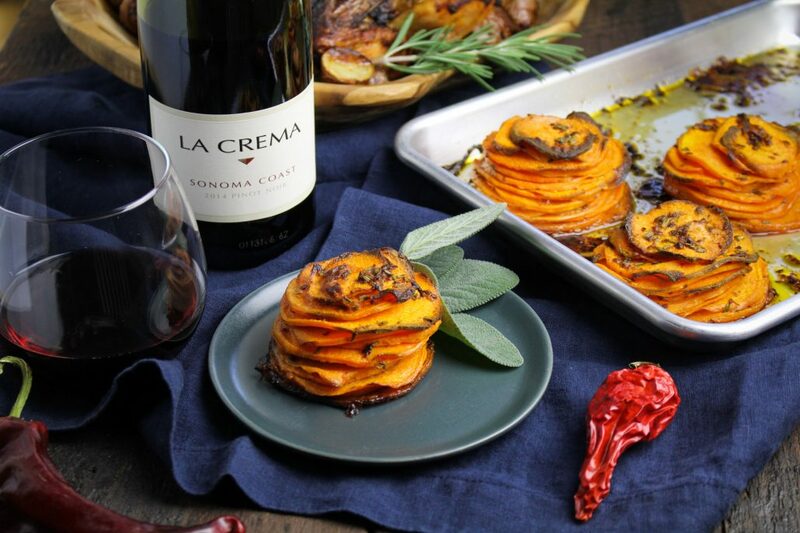 Like the other recipes in this menu, these Chipotle Sweet Potato Pommes Anna pair well with La Crema’s Sonoma Coast Pinot Noir and Sonoma Coast Chardonnay. 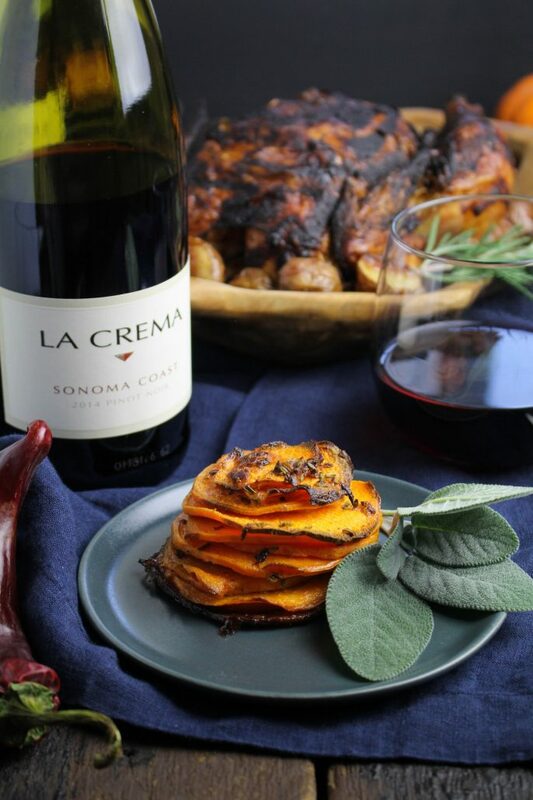 The classical French potato dish Pommes Anna gets a Latin kick with sweet potatoes and chipotle. Preheat the oven to 400 degrees F. Slice the sweet potatoes into rounds as thinly and evenly as possible (use a mandoline if you have one), adding the slices to a large bowl as you work. Melt the butter in a small saucepan over medium-low heat. When the butter is melted, add the minced chipotle pepper, adobo sauce, and minced rosemary to the butter. Stir together and cook for about 90 seconds, just long enough to gently fry the rosemary. Remove from the heat and pour over the sweet potatoes, then sprinkle the sea salt over the potatoes. Use your hands to toss the potatoes in the butter, making sure you’ve fully coated every slice. Stack the sweet potatoes into four to six neat piles, using the largest slices on the bottom and the narrowest slices on the top. Compress stacks slightly and place in the oven. Roast until the edges of the potatoes are crispy and the centers are tender when poked with a fork, about 30-35 minutes. Remove from the oven and serve immediately.